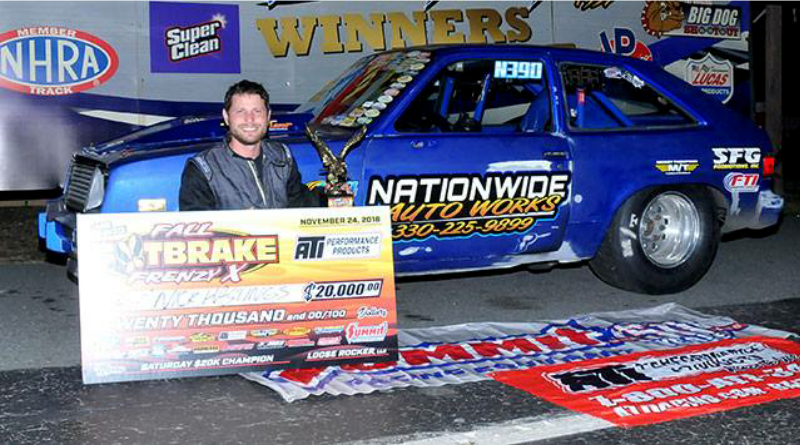 JULIAN, N.C. – Loose Rocker Promotions completed a successful two-week run at Piedmont Dragway with the completion of the 10th Annual Fall Footbrake Frenzy. A week after completing the American DoorSlammer Nationals, racers lined up for a shot at the huge paydays awaiting the footbrake competitors. As always the Loose Rocker guys did everything they could to put on a great race even though the weather presented numerous challenges. Originally slated for three days of footbrake bracket racing action paying $10K-$20K-$10K, the event schedule was adjusted to include two races both paying $20,000 each. Friday’s Warm-Up race turned into a $20,000 to win event when the forecast called for rain on Saturday. Over 200 racers braved the cold weather in hopes of collecting a huge payday. As the race entered the quarterfinal round, only five competitors remained in competition including Rodney Finchum, Joe Foley, Kevin Pollard, Chris Plott, and Kurt Holland. Finchum picked up the easy win after Foley turned it red by -.005, Pollard used a 10-pack in his pickup truck to take down Plott, and Holland took the bye to the semifinals. The win for Pollard earned him a bye run to the final while Finchum ran dead-on 2 to take a .005 win over Holland. Pollard found himself in another big money final round which has been common place this season as he has consistently won at the highest levels of the sport this year. Finchum of Fast & Finchum fame on Facebook was looking for the biggest win of his career. As fans watched live on Facebook, Finchum consistently goes live with each run, Finchum left with a .028 light but it didn’t matter as Pollard turned it -.005 red handing him the big check. After Saturday was washed out by rain, racing picked up again on Sunday with another $20,000 on the line. The weather didn’t scare anyone off as 243 racers lined up for their shot at the big check on Sunday. As final eliminations reached the quarterfinals only six racers remained in competition including Don Baugher, Dave Dissinger, Nick Hastings, Matt Ricchezza, Jason McCandless, and Allen Farmer. Baugher used a .026-package to take down Dissinger, Hastings took a .001 win over Ricchezza after posting a .028-package to Ricchezza’s .029-package, and McCandless threw away a .007-package after Farmer was -.003 red. McCandless earned the semifinal bye run in his wheel-standing wagon while Hastings picked up an easy win after Baugher missed the tree posting a .119 light to Hastings’ killer .008. The final round included a couple of unique hot rods with Hastings’ Pontiac T1000 (Chevette clone) taking on the Dodge Wagon of McCandless. Once again Hastings posted an outstanding .002 light to take command of the race after McCandless missed with a .051 bulb. Hastings cleaned it up at the finish posting a .039 over 6.189 to easily cover McCandless’ .022 over 6.732. The win was Hastings’ fifth at a Loose Rocker event making him the winningest driver in Loose Rocker history. Hastings also won the $40,000 ATI Bigfoot in April of this year and was the defending champion from the 2017 Fall Footbrake Frenzy. What an impressive run this young man has made over the last couple of years. And that wrapped up another successful season for Loose Rocker Promotions. Stay tuned for the 2019 Loose Rocker race shedule. DragChamp is your source for big money bracket racing results and sportsman racing news online.